On the evening of 14th May, the Sallis Benney Theatre played host to the first edition of Brighton Voices – a new series of events allowing the University of Brighton to bring together our outstanding academic experts with some of our amazing former students who are working in important fields and making significant advances in their areas of passion and interest. 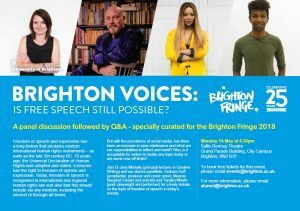 The objective of each event is to encourage discussion and debate on timely societal issues, demonstrating that the University of Brighton and its wider community of alumni and friends can provide constructive and meaningful contributions on matters we all care about. 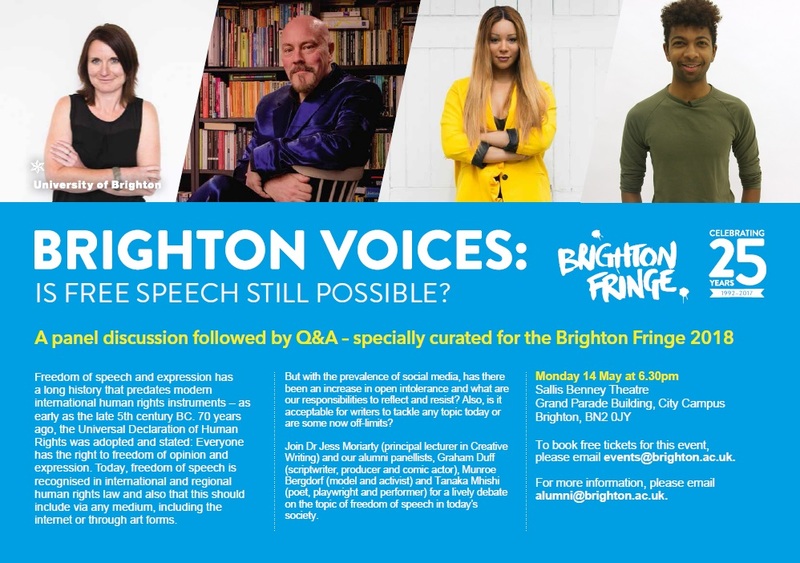 This first Brighton Voices event focussed on the question: “is free speech still possible?”. Freedom of speech and expression has a long history that predates modern international human rights instruments – as early as the late 5th century BC. 70 years ago, the Universal Declaration of Human Rights was adopted and stated: Everyone has the right to freedom of opinion and expression. Today, freedom of speech is recognised in international and regional human rights law and also that this should include via any medium, including the internet or through art forms. But with the prevalence of social media, has there been an increase in open intolerance and what are our responsibilities to reflect and resist? Also, is it acceptable for writers to tackle any topic today or are some now off-limits? Dr Jess Moriarty (principal lecturer in Creative Writing) chaired the event and was joined by our alumni panellists, Munroe Bergdorf (model and activist), Graham Duff (scriptwriter, producer and comic actor) and Tanaka Mhishi (poet, playwright and performer) to share their perspectives on the topic of freedom of speech in today’s society, before opening up the discussion to the audience of students, staff, alumni and local community members. A range of elements were addressed including the changing language used to describe different statuses and how sometimes language can divide as well as unite us, the importance of using the right sort of opportunities to address bigotry, how creating abhorrent characters within fiction can help raise awareness and eradicate discrimination and how although we have a legal right to free speech, we also have a moral obligation in the way we use our rights. 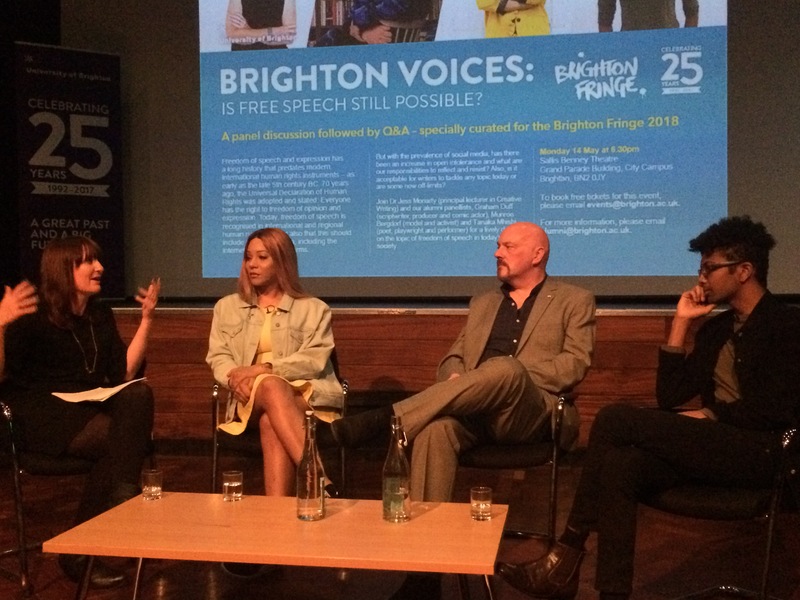 The audience asked the panel members for their thoughts about the future of free speech and also whether there are still challenging times to navigate before Utopia could be reached. A thoroughly enjoyable evening of lively and insightful discussion with a few laughs along the way! More Brighton Voices events will be organised in the coming months to showcase the impact and expertise of our academics and alumni.